Many marketers are still using batch and blast tactics for their emails and are often limited in their personalization efforts to merging data fields, such as name and company, that are available in their CRM systems. And that's a missed opportunity. Consider: 82 percent of shoppers say they would buy more items from a brand if the emails they sent were more personalized. So, what are the email personalization secrets that are driving increased revenue? What are marketers experiencing industry-leading growth doing to outperform their email marketing colleagues? 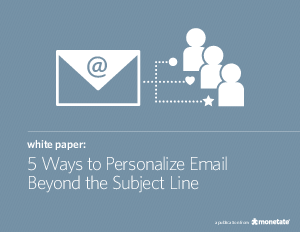 Download this white paper to learn the answer and five ways to start taking your email personalization strategy beyond the subject line.